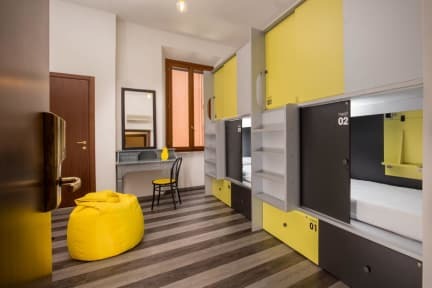 Free Hostels Roma is a new concept of boutique hostel providing high-quality service and comfortable accommodation at a very affordable price a few steps away from the most important ancient sites of the eternal city.Our mission is to make you enjoy your time in Rome, by offering you a modern and functional hostel, a reception open 24 hours and a lively and a young environment at our bar and terrace.Free wi-fi is available in the rooms as well as common areas.Our international staff will always be ready to help you with tips and advice on the best places to go, and will be available for any request or problem. An international breakfast buffet is waiting for you every day in our fully equipped common area. Our wonderful terrace will be the perfect place to chill out, know other people, play and eat. Our bar will be instead the right place to know what an Italian Aperitivo really means. 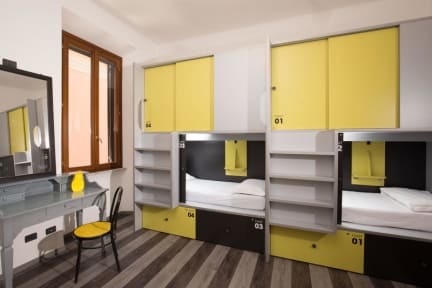 Free Hostels Roma is just about 300 meters far from Manzoni Metro Station, and about 15-minute walk from Roma Termini Train Station. We are just far from Piazza Vittorio Emanuele and 19-minute walk from the Coliseum and other great monuments. Shops and restaurants all within a short stroll of us. All our rooms, double or shared ones, have air-conditioning and an equipped private bathroom; our beds with viscolatex mattress have been cleverly designed to provide optimal privacy.